At The Hotline, we often hear from survivors who are astonished at the level the abuse has just reached in their relationship. Something finally happened that made them feel scared for their lives, their children’s lives or their pets’ lives, and it is this fear that led them to reach out to us, “I have got to get out of this situation before that happens again, or before anything worse happens.” It is important to know that this fear is valid—people who are being abused know when their situation has taken a dangerous turn. It is an instinctive moment that changes everything. If you feel that the abuse in your relationship has escalated, understanding escalation can prevent further harm to you or your family. Escalation is when abuse gets worse, either suddenly or gradually. Escalation can be a transition from one type of abuse to another, or it can be similar types of behaviors increasing in severity. Gradual escalation happens more slowly, and might look like insults that steadily become crueler and more hurtful. Sudden escalation happens when abusive behaviors quickly become more severe, and might look like an emotionally abusive partner turning to physical violence for the first time. Over the course of an abusive relationship, it is common for abuse to escalate, and oftentimes survivors find themselves experiencing something they never thought their partner would, or even could, do. Why is Escalation So Dangerous? The reason why escalation is so dangerous is because the abuser is showing their partner that they can use new and more damaging tactics to continue to hoard power and control in the relationship. An abuser may test out whether they can get away with crossing a line that has never been crossed before, with the intention of creating a new and deeper level of power and control when they fear they are losing it. Abusers typically escalate when they feel they are losing control over the relationship, often because they feel that the independence of their partner has increased in some way or that their partner will leave. 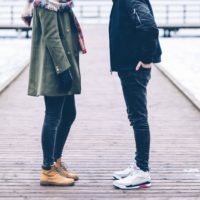 The escalation may be intended as a warning or a demonstration of what could happen if their partner decides to become independent. This warning is not to be taken lightly—leaving an abusive relationship is a dangerous thing to do. In fact, 75% of all serious injuries in abusive relationships occur when the survivor ends the relationship. This does not mean that the survivor should stay if they want to leave, but it does mean that any plan to leave should be a good, solid safety plan that takes into account the unique barriers specific to each survivor’s situation. Escalation is not your fault. You deserve independence and individualism in your relationship. If your partner responds to your request for independence by escalating their abusive behavior, it is a clear sign that you are with someone that seeks to gain power and control over you, which is abusive and never okay. Healthy relationships nurture independence, and nobody feels threatened by their partner seeking friends, safety, happiness, individualism or anything that brings them joy. Abuse is a choice—nobody is forcing your partner to take away your independence. Therefore, the fault of abusing (and escalating abuse) can lie only with the person making that choice—the abusive partner. Each person’s experience is unique and every relationship is different, so preventing escalation will never look the same in every situation. Preventing escalation usually consists of repeating behaviors that have calmed things down in the past. It might help to ask yourself, “What did I do last time my partner started to become violent? How did they react to that? What usually helps calm them down?” Some survivors report that submitting to their abusers for a short time keeps them safer. While it might feel terrible to submit to your partner’s control, there is no shame in doing what is necessary to keep you or your family safe. So even if preventing escalation means allowing the abuser to “win a small battle” in order to prevent a full-blown attack, it could be worth your while to stay safe for the time being. You are the expert in your own situation, so you know best how your partner might react to your behavior. It’s important to think of any escalation prevention method as a temporary way to stay safer for a limited period of time. Why? What this means is that if a certain behavior begins to ramp up, it is very likely to continue to escalate in the same direction. If there is a trend in new behaviors or a new set of threats, it is not likely to stop without significant intervention, or very clear signs that your partner is taking steps to change their behavior. Think of it like a ramp that leads up and begins to limit the ways in which someone can jump off to safety. The ramp is headed in a certain clear direction, so even if jumping to the ground doesn’t look safe now, it is important to consider that it could be safer now than later. Many survivors report taking a “wait and see” approach to the abuse, saying that if the abuse gets worse, it will lessen their feelings towards their abuser and cause them to want to leave. However, this can be a dangerous trap. The longer a survivor stays, the more power and control the abuser may gain, the more dangerous the situation can become, and the harder it may be to leave. If you’re worried about escalation in your relationship, it might help to think critically about your own limits. What is the point of no return for you? What behaviors are you unwilling to put up with? How far up on that ramp are you willing to go? Knowing what is absolutely unacceptable to you and where you draw the line can be an important step in safety planning. It is always up to you whether you choose to stay in or leave an abusive relationship, but knowing your limits may prevent you from gradually accepting more and more dangerous behaviors as a normal part of life. You deserve to be safe and happy in your relationship. If you need to brainstorm about keeping yourself safe in the face of escalating abuse, our advocates are here for you, 24 hours a day, seven days a week. Chat at www.thehotline.org or call 1-800-799-SAFE (7233) when you’re ready to talk it over. I can’t tell you how much the hotline helped me….. Without the helpline, I don’t think I would have made it. When there was no one to talk to at night – you were there for me…. thank you so much. I am finally free of his abuse. I recommend anyone in an abusive situation, call, call, call. Aris R., Thank you for this article, it is helpful and I appreciate the advice to consider my own limits of what is unacceptable- of where I draw the line. This point is difficult to consider but a logical and necessary start to gather my thoughts and plan. Thank you for your insight.